A ceiling hoist can help people who have difficulty safely moving themselves or others around the home. It takes little physical effort to use a ceiling hoist to move people from one position to another or from one place to another. Ceiling hoists help many people — for instance, people who want to remain in their own homes despite changes in their mobility, strength or agility and parents of children with a disability who can no longer lift their children. A Ceiling hoist can allow a spouse, partner, parent or caregiver to help with moving the user in or out of bed, to and from the toilet, in and out of the bath or shower and just general movement around the home. Which can help maintain independence and allow people to stay in their own homes. A ceiling hoist is mounted onto a ceiling, it is usually electrically powered, but there are manual units. An electric hoist with a sling system is attached to a ceiling track and the person is lifted in the sling and moved along the ceiling track, either around the room or across various rooms if required. You must provide a clear path of travel along the route of the track, particularly at door frames for a system that connects two or more rooms. As the name suggests a mobile hoist is a hoist you can use all around your home, to get in and out of the car and most mobile hoists can be easily folded away to use on day trips or holidays. Mobile hoists are also a great idea to use if you have small tight spaces but still allows safe comfortable transfers from wheelchairs, stairlifts, toilets etc. 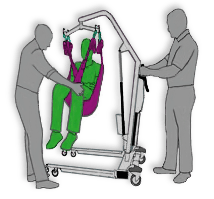 Mobile hoists can generally be used by one carer thanks to their versatile and easy to use design. There are various pool hoists available to suit users needs, most are fully mobile allowing access to any area of the pool. Pool hoists enables access to the pool for people with reduced mobility in a safe and functional way. As an independant supplier we are not tied to one particular manufacturer of ceiling hoists, mobile hoists and pool hoists so we will offer you honest and impartial advice on all aspects of supplying and fitting you Ceiling hoist. Please contact us for more information.